Bike sharing is popular in major cities around the world, but many government-funded programs have actually proven to be financial burdens. "It's really expensive to use a kiosk system, there has to be something better," said Angsgar Strother, founder of A2B Bikeshare, which wants to give smaller cities the benefits of bike sharing without the cost. Strother's approach involves eliminating the kiosks and docking pads of traditional bikeshare models and replacing them with a touchscreen console on the bike itself. While riders pick up and return bikes to traditional racks, there are locking mechanisms on the bike itself, which means the racks don't need to be high tech. Strother said this lowers capital costs from $5,000 to $2,000 per bike. A2B is currently operating a pilot in Lansing, Mich. With a fleet of 20 bikes, members pay $40 per "season" (typically about four months) which gives them the first half hour of every ride free, plus a $2 for each additional half hour. 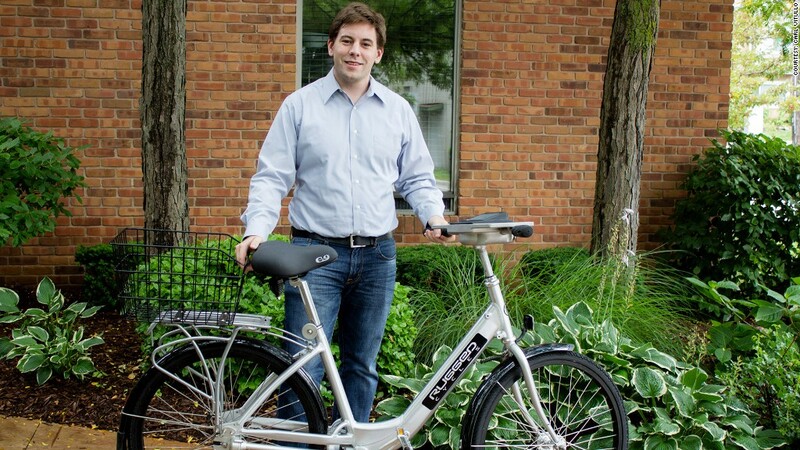 As winner of the MobiPrize for Michigan Entrepreneurs, sponsored by NextEnergy, A2B Bikeshare received $5,000 in funding, which it will use to help roll out 100 bikes in Fairbanks, Alaska, this fall.